Featuring: Michael Glenn Murphy, Tadhg Murphy, Mercy Ojelade, and Raymond Scannell. The Fleck Dance Theatre is hard to find. It’s kind of hidden in a mall on the second floor of Queen’s Quay Terminal. It is also completely blue inside, which I really like. It is both comforting and fancy. The Walworth Farce written by Enda Walsh and directed by Mikel Murfi opened there last Tuesday and it drew lots and lots of people to its blue box office. The play begins gently, with the Irish Toura-loora-loora song playing on a tape deck in an awful apartment. Three men, Dinny (Michael Glenn Murphy), Sean (Tadhg Murphy), and Blake (Raymond Scannell), sporting varying degrees of baldness tend to an acrylic wig, attempt to cook a large sausage, and massage thick creams into their scalps. Very abruptly the music stops with the click of a tape deck. Then things get very hectic. The men are, I gather, acting out the story of their departure from Ireland. There are two cardboard coffins on either side of the stage. Everybody is yelling for a very long time. If I sound fuzzy on the details, it's because I am fuzzy on the details. For almost the entire first act, the three men frantically tell and retell the same story at a very high pitch presumably led by Dinny with the other boys in his frightening command. I don't have the enviable ability to force myself to focus when things get atonal. This is why all of math is mysterious to me. Audience members sharper than I found the activities on stage hilarious. I saw that they were doing funny things, but the consistent ultra fast pace and high volume lulled me into a sort of trance. It's not an entirely unfortunate place to be and I think it was completely intentional. Helpless repetition is also at the heart of Daniel Karasik's new play The Crossing Guard, directed by Anthony Furey. In it, seventeen-year-old Timothy (Karasik) makes a daily routine of showing up at the crosswalk where his sister went missing seven years ago. The play is staged in the Tarragon studio space which is neither blue nor fancy. I liked this space just as much as the Fleck. I like places that are small. Karasik's crosswalk is and has always been governed an elderly crossing guard named Jim (Gary Reineke) and he guides Timothy back and forth across the same street with his stop sign, whistle, and fluorescent orange vest. The two have light conversation and it becomes clear quickly that neither party is especially happy with Timothy's continued visits; it is a compulsion rather than a decision. The Walworth men's frenzied routine comes to a halt rather abruptly with the appearance of Hayley (Mercy Ojelade), a young female supermarket employee. She is helpfully (flirtatiously?) bringing a bag of groceries Sean had forgotten at her checkout. She is so normal, so much a part of the outside world that she brings to the attention of the characters the strangeness of their actions. It is clear that she might love Sean a little bit, and in this lays hope for his escape from Dinny. Similarly, Timothy's routine comes to a halt rather abruptly with the appearance of Miriam (Monica Dottor), a young female crossing guard filling in for Jim. She is so normal, so much a part of the outside world that she forces Timothy to question the health of his street-crossing, sister-seeking practice. It's unclear whether her interest in him might bring hearts to his eyes, but it seems like a possibility. Women can be so refreshing. Initially, both Walworth's Hayley and The Crossing Guard's Miriam could be taken for a sort of “Vestal Virgin” in their respective stories; the young woman who through her vitality and sensuality awakens and renews the tired soldier/statesman/lost guy. This is still a consistent theme in Western story telling and I remember seeing trailers for a treacherous looking Jennifer Aniston movie called Along Came Polly in which she plays a free spirited bohemian who convinces a downtrodden businessman to do a bunch of dumb stuff that includes him climbing to the roof of a skyscraper and screaming at the top of his lungs. I think the conclusion of the movie shows that he has some kind of break through that leads him to become an artist. Aniston’s character dies of cancer, but the businessman learns his lesson and doesn't need her anymore, having grown as a person. There are so many billions of movies and plays and books like this, I know the story so well that I could watch it in my head. Fortunately, in neither of these plays do the women have the redemptive qualities that we think they will. In fact they contradict the Vestal Virgin paradigm. Though they both show up with hope written all over their faces, neither Hayley nor Miriam can affect any kind of positive change. Hayley becomes a captive of Dinny; forced through her tears to participate at knifepoint in the reenactments. Rather than waving flag of redemption, her helplessness reinforces for Sean his own captivity, and though she finally escapes (after Dinny and Blake kill each other and lie dead on the floor), Sean is unable to follow her, feeling instead more destroyed than free. The Crossing Guard's Miriam manages to convince Timothy that he should break his back and forth across the street habits, move on with his life, go to college, and possibly meet a girl. 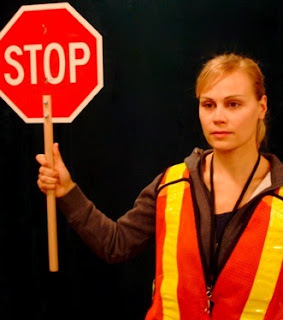 On the day he decides to quit, Jim the original crossing guard shows up and practically wrestles the young protagonist into a fluorescent orange vest, passing the ceremonial stop sign into his hand. Before Timothy can argue, Jim crosses the street and gets hit by a car leaving Timothy in crosswalk purgatory. At the heart of both of these plays is the fear that we are powerless to change our own fortunes. If we are stuck in a routine, we probably deserve to be stuck. It's no co-incidence that two different plays in different styles by different theatre companies on opposite sides of the world opt for the choice of no escape. Neither Karasik's Timothy nor Walsh's Sean is bound to repetition for any reason other than their own misplaced sense of duty. Both have a clear way out and a willing helper, but feel utterly beaten and helpless by circumstances larger than themselves. It's surprising, because now that “God is Dead”, it would seem as though there are no circumstances larger than ourselves. We should be free to walk but it seems as though what all of these characters need is someone to save them. We still (as Jennifer Aniston movies would indicate) believe in the redemptive powers of love. It's just that we haven't seen any proof. Theatre, not having the spectacular funding that Hollywood does, feels free to point a finger at this. There are no Vestal Virgins anymore so we're all on our own. We have to change our own circumstances, though sometimes we can't. Labels: ANTHONY FUREY, DANIEL KARASIK, ENDA WALSH, GARY REINEKE, HARBOURFRONT CENTRE, MONICA DOTTOR, PEANUT BUTTER PEOPLE, TANGO CO.